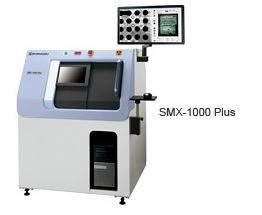 The SMX-1000 Plus and X-ray inspection systems are a further refinement of their popular predecessors, the SMX-1000, which have become the benchmarks of the industry. The operability so well received in earlier models has been further improved, resulting in much simpler and easier-to-see windows. The enlarged fluoroscopic exterior image view provides a new level of visibility. The measurement functions are so much easier to use that results can now be obtained with just a click, and require no complicated parameter settings. New functions such as enhanced region-of-interest display have been incorporated, complementing a wealth of conventional functions including navigation via exterior images, step feed, teaching, and image browsing. Both the SMX-1000 Plus and SMX-1000 Plus provide high-magnification nondestructive fluoroscopic examinations of junction conditions (disconnect, contact) of ultra-micro parts on high-density PCBs, BGAs, CSPs, or system LSIs. Remodeled windows and an enlarged display with a simple, user-friendly layout ensure the intended operation is performed without guesswork. As with earlier models, the combination of flat panel detector with Shimadzu image processing technology leads to clear, distortion-free images. The flat panel detector with a tilt angle of up to 60° enables fluoroscopy over an extensive range while maintaining constant magnification, so defects that are undetectable with vertical fluoroscopy can be detected. Troublesome measurement parameter settings are automatically optimized, and thanks to our proprietary image-processing technology, measurement results are now obtained with simple mouse operations.